As the year 2010 drew to a close, the number of biomacromolecular structures available in the Protein Data Bank (PDB) archive exceeded 70,000. 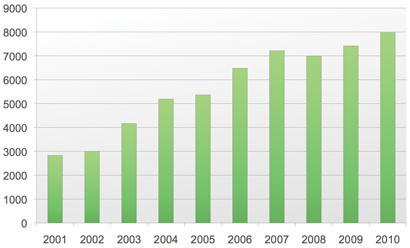 The PDB archive has nearly tripled in size since the wwPDB was formed in 2003. Today, the wwPDB receives approximately 25 new experimentally-determined structures from scientists each day for inclusion in the archive. In 2010, more than 260 million data files were downloaded or viewed online from wwPDB member sites. Users include structural biologists, computational biologists, biochemists, and molecular biologists in academia, government, and industry. Data are also used by educators and students furthering their understanding of biology. Other wwPDB highlights from 2010 include the provision of Validation Report PDFs to depositors and the requirement of chemical shift data for NMR depositions. wwPDB members have also recently published papers that describe resources available from member sites.1-3 wwPDB news and announcements are posted at wwpdb.org and available via RSS feed. wwPDB organizations host PDB data deposition, processing, and distribution centers. wwPDB members are the RCSB PDB (USA), PDBe (UK), PDBj (Japan), and BMRB (USA). 56628 structures were released between 2001 and 2010. 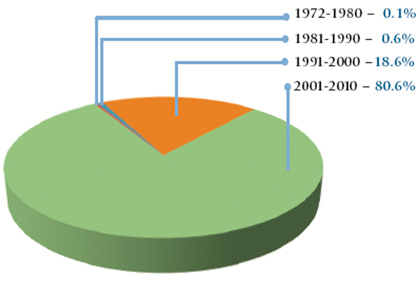 Deposition and release statistics are available at wwpdb.org.